We’ve heard this search thing is going to be big some day. Google or Yahoo are great for finding general stuff on the web at large, but sometimes you want to find real posts from real people, and blogs are great for that. There are blog search engines, but when you search for “kittens” you’re as likely to see an offer to enlarge your mortgage while working at home. WordPress.com is fast approaching 3 million blogs, with hundreds of thousands of posts and pages being created by our brilliant and attractive users every day. Tags and categories help group the content, but finding exactly what you are looking for can still be tricky. We also feel like you guys are creating some of the best stuff on the web, there’s a natural selection of people tasteful enough to end up on WordPress in the first place. 😉 That’s where our new search feature comes in. Search results can be ordered by relevancy, our magic secret sauce algorithm that’s the default, or by most recent, so you can see the latest and greatest on any given subject. International communities are very important to us, so from day uno we have language-specific engines for every language we support. For example, Spanish search is at es.search.wordpress.com. To assist in your exploration we analyze related tags based on your search terms, with the most popular related tag at the top. For those who want to keep up to date with changes to the search results, just subscribe to the RSS feed of the results (at the bottom of the related tags section). If you are like me, the first question you have is how long it will take for your new posts to show up in search results. I won’t keep you in suspense, the system is designed to have new posts in the index in under 30 minutes, often much faster. The search is powered by a new open source project called Hounder from a company we worked with called Flaptor. Check out the new search here. It was awesome to have Matt on our show to give us the scoop!! Great . I saw Matt talking about this in a video podcast . This is going to be cool. Do you have the option for your blog to come up only in the WordPress search but not on other search engines like Google, Yahoo, etc. Not currently, but that’s an interesting idea. Really? Attractive? That wasn’t what I was going for. And I’m sure that the search will help. great guys! again congrats at the WP team!! it works great! Can’t wait to try it. 😉 Good job. Yahhh, been waiting for a long time for this. Question: don’t you mean en.search.wordpress.com as the last link, not en.forums.wordpress.com ? Hm. When I click “Check out the new search here” it takes me to a page to search the FAQ. That’s not exactly what I had in mind. ?? Bottom link on the post now points to en.search.wordpress.com. Thanks. I have been waiting for the function for … oh, since I started blogging on WordPress. If I had more than two thumbs, I would give y’all a hundred thumbs up. Seriously. That’s a great improvement! Thanks! Is there a way to get to the search page directly without being on your post? another great concept from wordpress! 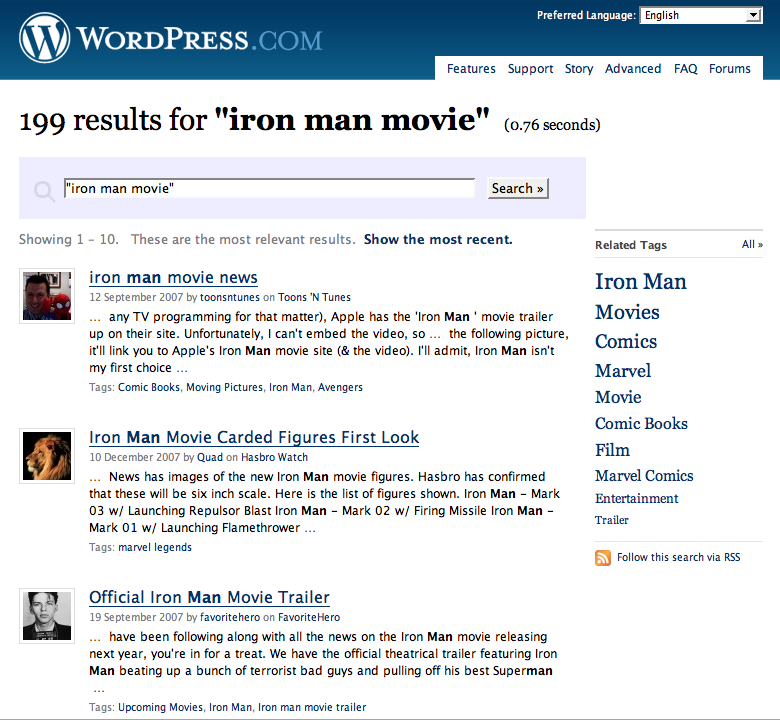 Is this wordpress search going to be available as a feature on our blogs? Nice feature, but it could do with some tuning. I went to http://el.search.wordpress.com/ and typed in greek “χρώμα” (“hroma”, it means “colour”). No results at all, although there are posts in greek blogs using this word (for example, mine; in post title and text). Then I searched for “colour”: hey, presto, posts from greek blogs with “colour” inside. Shocked, I flapped away from Flaptor. We are looking into that. Update: The language specific issues are fixed now. Wonderful. I already found some interesting information. Thanks! There seems to be a prob with the secret sauce algorithm. When I do a search for “The best looking blogger on wordpress” I don’t even come in on the top ten results. This will lead to a better result. I can has plastik sergereeeez? WORD!!!! Good to see this feature is up! Now if only my blog appeared in the search results haha! I believe you are on to something. Search and help options are two of my favorite and most used options on a webpage. Having the posted blogs categorized in approximately 30 minutes will be great asset. Organization by subject and how recent blogs are posted will be valuable as well. You stated that one of the ways you will organize blog subjects is by relevancy. Will you provide a percentage amount for categories based on relevancy? Will the person searching for a forum be able to choose how they want to organize their request? Do you have category names for tags already created for individuals who have difficulty deciding what tags should be used for their blog? Thank you! This is much easier than searching for blogs using the tag system. Wow, this is awesome. It’s MUCH better than the old wpfind. Aniway, can us (WP blog owner) add this great stuff at our blog sidebar, just like Google? Well this is a great feature designed to help us and an opportunity for WordPress too. wordpress is now anything nearing perfection…..i mean you guys are doing a fab job, giving such fascilities, i m now addicted to wp and wish you can go really long and long….very nice job done…. It’s good. But why did you seperate it into different languages??? There should be an “all languages” version, at least. It’s impractical if you have to search several times to get all relevant posts. I tried searching “bagpipes” (because I play them) and got lots of interesting and relevant posts, including one on dieting and bagpipes! Where else are you going to get content like that? Cool. This is great! Thanks to everyone at WP and Flaptor. 🙂 Any chance we could get it in a Firefox add-on as well? It’d be very useful. i’ve try in french and with the word “psychomotricité” no results. Why? Well it’s about time! That was the only thing missing at this point from WordPress being GREAT! congrate!! this is really awesome.! keep growing WP! Great new feature. The possibilities with subscribing to feed searches is impressive. Just one thing, could the search feature be linked to from the homepage? It could be tagged onto the top menu, potentially. Ya era hora, que algunas veces no había forma de encontrar algo. amazing new feature. how about an advanced search, like searching blogs in 2 languages in the same time? Great, I loved it! It would be great to incorporate this feature into our blogs. Thanks a lot! Bug Gujarati (http://gu.search.wordpress.com) doesn’t yield any results. Strange. Not in English nor in Gujarati. We’ve recently resolved some issues with language specific search. If you are still having problems with gu.search.wordpress.com please contact support with the needed details to recreate the problem. This feature is good however, I feel that it needs more tweaks in terms popularity based on topics. hi, why don’t u put the search box in all the main sites itself? tough 2 know and remeber to go to search.wordpress.com ! also, i tried searching at bot ta.search.wordpress.com and en.search.wordpress.com for queries in tamil language and there are no results for any query (even popular words which r sure to be in any tamil blog). any idea? There’s now a search box at the top of WordPress.com. We’ve recently resolved some issues with language specific search. If you are still having problems with su.search.wordpress.com please contact support with the needed details to recreate the problem. Now that’s a nifty feature. Correct, private blogs will not show up in search results. You have been such busy kiddos. I like this much more than the new dash. I typed in Kuwait elections. Supposed to be starting with most recent, the first article was from the previous elections in 2006. 2006 articles were interspersed with 2008 articles. How do we get to the search feature from our desktop? How do we find the search feature when at WordPress.com? If you contact support with the specific details of your search and what you saw in the results that were unexpected we’ll take a look and see what’s going on. We’ve also added it to the top of the WordPress.com site. Question: Will non-WP.com blogs & blog posts come up in the search? Blogs such has Cheezburger, Stuff, PoliticalTicker, ACLF etc? On the zero results search with related tags, contact support with the specific details and we’ll track down what’s happening there. Well done WP! This addition’s just about enough I think to make me forgive you for introducing that new dashboard. Like to echo some of the other commenters here… it’d be great to be able to incorporate this into our blogs. and I agree with AJ on being able to disable google and yahoo but enable just wordpress for our blogs to appear in. Excellent, thanks for the follow up. I think your secret sauce needs some work. I didn’t get very accurate results. None of them gave very satisying results. And I don’t mean just because my posts didn’t come near the top, it looked like the results were very jumbled, and the secret ingredients to determine relevance were not mixing well. I would like to see the blog search fixed first – having some options on the way the results display. Since I have videos on most pages, I set my page display to one or two, but that sets the search results to one or two per page. Thanks very much for the excellent software and service! It would be hard to fault that. How do I get to it from my dashboard? Awesome, this was one of the things I thought the site needed for a long time. Been waiting for this feature! Grrreat!!! 😀 Thanks for the ever increasing features. Do you guys ever sleep at all? Or do you do your code while sleeping? 😀 Awesome. BTW, I am waiting for a feature to ‘hide’ a particular post from public search engine. It’s just not fair for people who want to search for the real thing but stuck to my rubbish instead. The usual option for keeping your blog out of search engines is under the “Settings -> Privacy” section of wp-admin. There isn’t a specific option to do this on the post level, but you do have the option of making a post private by checking the “Keep this post private” box on the write post screen. Hurrah! My search for a search function is over at last. Spanks alot! Sweet. Much better than clicking on a tag! I am a fan of this feature in a big way. that’s really cool, better than the tags. good job!